This week-and-a-half’s feature club is Inter Milan: the most successful Italian club of the last decade and one of the most storied clubs in world football. Inter are probably one of the first clubs you think of when Serie A is mentioned, and for good reason. They have been tremendously successful over the past few years and, despite their recent troubles, are one of the biggest clubs in the world. Some of the world’s greatest players have strutted their stuff for the Nerazzurri over the years, and their list of honours is very enviable. Only Juventus (27) have won more than Inter’s 18 Serie A titles (although they’re tied with city rivals AC Milan) and their Barcelona-toppling, Champions League-winning 2009-10 campaign was remarkable. They are a hugely popular side with a big global fan base, and I really, really don’t like them. It’s not because their popular or successful or because I have a big distaste for any of their personnel (I’m a big José Mourinho supporter and an admirer of Javier Zanetti). I dislike the Nerazzurri for the way they benefited from Calciopoli and the penalties handed to their biggest rivals, even though their hands were just as dirty as anybody else’s (except Juventus, perhaps). I assume that if you’re reading this blog then you probably know a thing or two about Calciopoli already, but if not I’d recommend using good old Wikipedia (shhh, you at the back) to read up on it. If you don’t know it as “Calciopoli” then you’ll probably know it as the 2006 Italian Football Betting Scandal. Teams were accused of rigging games by selecting “favourable referees” for certain matches. Milan were deducted 30 points for the 2005-06 season, meaning they finished third instead of second. They were also forced to play one game behind closed doors in 06-07, and started that season on -8 points. Fourth-place Fiorentina were kicked out of the 06-07 Champions League, deducted 30 points for 05-06, had to play two games behind closed doors and started 06-07 on -15. Lazio, who finished sixth, were also deducted 30 points and booted from European competition (the UEFA Cup this time). This deduction left them just three points from relegation. For 06-07 they started on -3 points and had to play behind closed doors twice. Reggina’s president, Pasquale Foti, was fined approximately £20,000 banned from all football activity for 2½ years. The club were fined £68k and started 06-07 on -11 points. Juventus were handed the sternest punishment. Their Serie C1 relegation was changed to a Serie B relegation on appeal, and they were stripped of the Serie A titles they’d won in 2005 and 2006. They were kicked out of the Champions League, fined £31million, started 06-07 on -9 points and played three games in an empty stadium. I’d say that some of the punishments handed-out on appeal were a tad lenient given the enormity of the situation, but I’m no expert on the situation. Lazio, Milan and Fiorentina only started showing signs of recovery in recent seasons, Reggina are stuck in Serie B and Juventus haven’t been the same since. Considering Calciopoli’s impact on these clubs, maybe the punishments were fair after all. It doesn’t take a genius to see how Inter benefited from all this. Aside from being awarded the 2005-06 Scudetto despite finishing third, Inter had effectively seen their biggest rivals (Milan and Juventus) neutered. The lack of competition helped them two four legitimate straight titles until last season’s post-Mourinho demolition job. They dominated, and even won the league by 22 points in 2007. It speaks volumes of the impact Calciopoli had on Inter’s fortunes that they collapsed as soon as Milan were strong enough to mount another challenge. There is nothing exceptional about Allegri’s Rossoneri, but they were functional, consistent team and the strongest opposition Inter had had since the scandal. A lot of blame for Inter’s fall can be placed on Rafa Benitez’s dire man management and their ageing squad, but it’s no coincidence that they started to slide as their rivals recovered. The Nerazzurri weren’t exactly flying before Calciopoli either. They won just three titles in 40 years between 1966 and 2006, and their awarded 2005-06 Scudetto was the first they’d “won” since 1989. Inter often finished seasons without qualifying for Europe. Inter were also-rans to Juventus and Milan, and even the two Rome clubs (Roma and Lazio) won Serie A during Inter’s barren decade-and-a-half. Calciopoli turned them into a dominant force. They ruled the roost because there was nobody to challenge them, even if Roma did push them all the way in 2008. Mourinho’s influence shouldn’t be completely discounted but, on a domestic level, Inter were “better” by default. I wouldn’t have had a problem with this if Inter hadn’t actively taken part in Calciopoli. They weren’t punished, right? That must mean they were innocent? I wouldn’t be writing this if I thought they were. Inter were just as guilty of tarnishing Italian football’s reputation by participating in the scandal as everyone else, and the way they’ve trumpeted themselves as an honourable club in the aftermath is arrogant and hypocritical. Inter aren’t innocent. It was found last year that the Nerazzurri’s then-president Giacinto Facchetti (RIP) had contacted Italian football’s referee selection committee to “discuss” which referees should officiate their games, just as Fiorentina had done. I’m not conspiracy theorist, but it’s very suspicious that we’ve only just heard of these discussions and the telephone transcripts weren’t leaked to the press at the time (as Juve’s were). Juve have always protested their punishment and it’s hard to feel sympathetic for them, but they do have a point. Why weren’t Inter implicated? The Bianconeri were crippled by Calciopoli, and, if what I’ve read is to be believed, Inter should’ve been reprimanded as well. FIGC president Franco Carraro resigned in 2006 after the first wave of phone calls had been revealed. Guido Rossi, Inter’s vice president, came in to head the investigation and soon, not long after the verdict was announced, left his position to head TIM (a branch of Telecom Italia). Telecom Italia are Italy’s biggest telecommunications company, and the ones who wiretapped the phone conversations between convicted Juventus president Luciano Moggi and the referee selectors. Last year’s Inter-implicating calls were leaked by Moggi’s lawyers, not Telecom Italia. Rossi was good friends with Inter president Massimo Moratti, who was also on the TIM board. Putting two-and-two together, it’s not hard to see what was going on. Rossi must’ve known what was going-on with Inter, and given his involvement with Moratti (and Moratti’s involvement with Telecom Italia) it would’ve been in everyone’s best interests to keep Inter’s Calciopoli involvement under wraps. The Calciopoli scandal continues to rage-on and attempts to prove Inter’s guilt continue. I’m willing to accept the possibility that these theories on the Nerazzurri’s involvement are nonsense, but it certainly doesn’t look like that’s the case. I’m going to use this week to do some more research on Calciopoli and hopefully get a better idea of what really happened during the 2005-06 season. The timing couldn’t be any better (with fresh Calciopoli-related sentences being handed-out last night), and I’m looking forward to getting stuck in. I was always going to give Enrico Chiesa some props this week. Sure, Gianfranco Zola and Hernan Crespo were probably better players, but I had too much fun watching Enrico when I was younger to pick either of them over him. Besides, I mostly know Zola from his time with Chelsea and there’s only so much I can say about his Parma career. Crespo? A great goalscorer, no doubt, but nowhere near as eye-catching or exciting to watch. I’m going to try and keep this as concise as possible. Over-analysing Chiesa would only dilute the pure, unbridled joy I still get from watching old footage of him playing, and I really don’t want to do that. For me, watching Chiesa playing (and scoring) was pure entertainment. It was all about great moves and great goals. Some of the goals this guy scored were just perfect. Long-range drives, delicate chips, volleys, headers, toe pokes: Enrico scored them all. He was a great goalscorer and a scorer of great goals, and there aren’t many other strikers who can say that. One goal that I always remember is Chiesa’s wonderstrike in the 1999 UEFA Cup final. Parma were already 2-0 up against French giants Marseille after goals from Crespo and Paolo Vanoli. Juan Sebastian Veron took the ball up the right flank in the 55th minute. 30 yards from goal, Veron chipped the ball towards the box. Crespo’s dummy foxed Laurent Blanc and the ball fell perfectly for Chiesa to rifle a perfect volley into the top corner from 15 yards. The above video encapsulates everything that Enrico Chiesa was about for me. Those great, great goals. Those astonishing moments of beauty that draw us to the sport in the first place. Chiesa’s goals for Parma, Fiorentina and Sampdoria played a huge role in getting me interested in calcio in the first place, and he didn’t score many better (or more significant) than the above. Once described as playing like “a cross between Paolo Rossi and Gigi Riva,” Chiesa was an incredibly well-rounded striker. Capable of playing advanced and dropping deep, he moved quickly and had a cannon of a right foot. When the ball landed at Chiesa’s feet you knew something exciting was going to happen. He was a game-changing forward who could turn a game’s tide in a split second, and that’s what made him so special. Enrico wasn’t a perfect player, but few could light a stadium up like him in his prime. 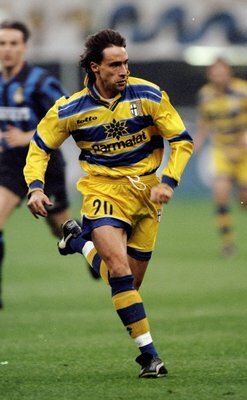 He played for the Gialloblu for a total of three seasons, scoring 33 goals in 92 Serie A appearances and countless more in Europe (he scored 8 in Parma’s 1998-99 UEFA Cup run alone) and domestic cups. During his time at the Stadio Tardini he broke into the Italy squad, scoring a credible 7 goals in 17 Azzurri appearances. He left Parma for Fiorentina in 1999, and had further spells with Lazio, Siena and Figline before retiring last year at the ripe old age of 40. Chiesa is currently enrolled in a coaching course at Coverciano, the famed Italian football education centre. I can only hope that the teams Chiesa goes on to manager play with the same zest and exuberance as Enrico in his pomp. I could waste another 500 words rambling about Enrico and his career but I’d rather not. Instead lets just sit back, relax and watch the great man doing what he did best: score goals. 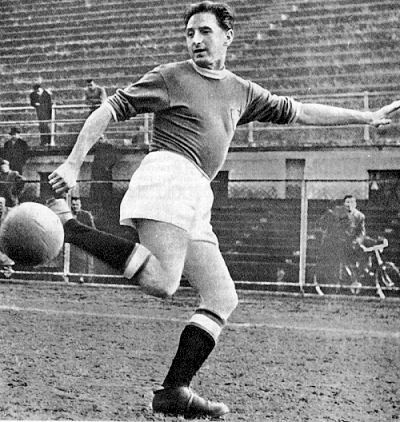 Silvio Piola is the highest goalscorer in Serie A history. Scoring 274 league goals in 537 appearances, Piola scored 49 more goals than his closest rival (Gunnar Nordahl) in a career spanning four decades. Also boasting 30 international goals in 34 Azzurri games, Piola is rightly remember as one of calcio’s all-time greats, and he spent the last seven season of his career with this week’s feature club, Novara. Joining the Biancoazzurri from Juventus in 1947, Piola struck 16 goals in 30 appearances to help lead Novara to the Serie B title and promotion to Serie A. Thus began Novara’s longest ever run in the top tier: a period of eight seasons lasting until 1956, two years after Piola’s retirement. Scoring 86 times in his 185 Biancoazzurri appearances, Piola is so fondly remembered by Novara that they named their stadium after him in 1976. The Stadio Silvio Piola is still Novara’s home to this day, and recently underwent a 7,000-seat expansion for their first Serie A campaign since the fifties. Unfortunately, like a lot of Novara’s history, English-language information on Piola is hard to find online. Such is the problem when researching Italian clubs that aren’t based in Milan, Turin or Rome. The fact that Piola plied his trade so long ago doesn’t really help matters either, but this is where John Foot’s bible of Italian football, Calcio</I>, comes in. A legend for Pro Vercelli (who also named their stadium after him), Lazio and Novara, Piola was prolific everywhere he went and also enjoyed productive spells at Juventus and Torino. Piola signed for Novara aged 34, played for Italy until he was 38 and was 40 when he retired. Even in 2011, with all the advances we’ve made in sports science, it’s very rare for an outfield player to survive at the highest level for so long. Silvio Piola, however, knew how to take care of himself. Hedonism had no place in his life, with Piola shunning the limelight to concentrate on playing football and looking after his body. The general assumption was that he was going to Novara to wind down and retire: instead he maintained a goalscoring ratio of roughly one goal every two games and wrote himself into Biancoazzurri folklore. Piola was an out-and-out striker. Equally adept at shooting from distance and finishing up-close, Piola was good with both feet and strong in the air. His range of attributes made him a unique player for his generation, as Italy was more accustomed to producing “specialist” forwards during Piola’s era rather than all-rounders. His Azzurri goalscoring record is phenomenal, and he would surely have gone on to enjoy even more success had the Second World War not curtailed his international career. Piola won the 1938 World Cup with Italy, partnering Giuseppe Meazza up-front, his physicality providing the perfect foil to the technically outstanding Inter legend. Surprisingly, Piola failed to pick-up a single Serie A winners medal despite his goalscoring exploits and glorious international record. He finished as a runner-up thrice (once with Lazio, twice with Juventus) but the Scudetto continued to elude him until retirement. This is more to do with the clubs he played for more than anything else. Pro Vercelli’s dominant period ended seven years before Piola’s emergence, Lazio didn’t win their first Scudetto until long after his retirement, he was only at Juventus and Torino for a couple of seasons, and it would’ve taken a miracle for a club of Novara’s size to win Serie A, even with Piola’s contribution. Regardless of this silverware shortage, Piola is a true calcio legend. A Biancoazzurri hero, a lethal marksman and a great professional, his place in history is secure. I knew a bit about Piola prior to starting this blog, but I’ve really enjoyed learning about his legacy, international exploits and character. My only regret is that I couldn’t discover a little bit more about his time at Novara. Welcome to Around the Peninsula: an attempt at documenting the 2011-12 Serie A season, one club at a time. By doing this I aim to improve my own knowledge and understanding of Calcio, while hopefully shedding some light on what has become one of football’s most misunderstood leagues. No competition fascinates me more than Serie A despite my Scottish upbringing and affection for the English Premier League. Living in a post-Football Italia (and now, sadly, post-Calcio Italia ) Britain can make football in Italy tough to follow. I plan on getting around this by fully immersing myself in the fortunes of Italy’s top tier clubs for the duration of the season, and I welcome any like-minded individuals to come along for the ride. The idea is to nominate a different club every week and analyse their campaign with references to recent performances, upcoming fixtures, history, squads, and management. Special consideration will be given to Milan, Inter, Napoli, Lazio and Udinese on European weeks, and Azzurri internationals will be covered whenever possible. The site was thrown together on a whim so things are a little threadbare at the moment, but aesthetic improvements and additional content will come in time. For now, the main focus is to concentrate on this weekend’s Serie A action, starting with this week’s feature club A.C. Cesena and their Saturday evening clash with S.S.C. Napoli.